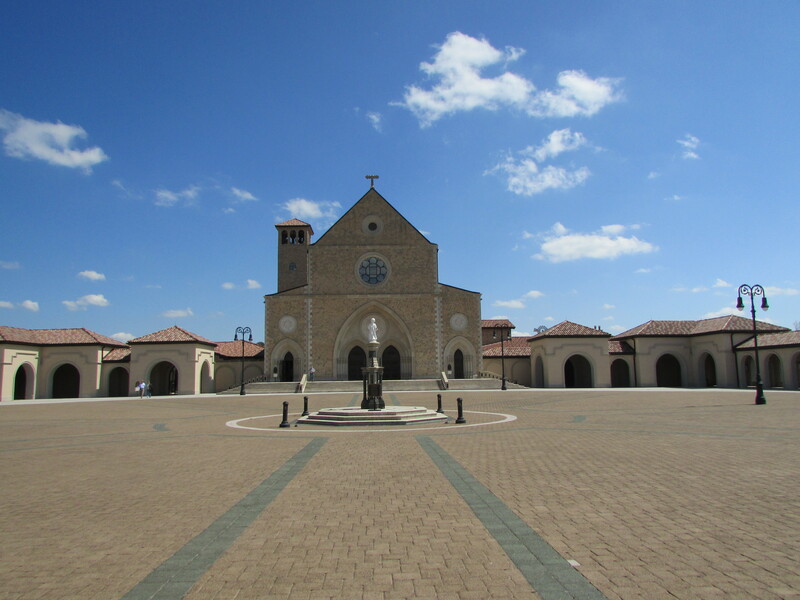 My pick for one of the most unexpected attractions in Alabama is the Shrine of the Most Blessed Sacrament at Our Lady of the Angels Monastery. It’s near the town of Hanceville in Cullman County north of Birmingham. My mother’s family hails from Cullman County and for that reason I tend to think of the area as a Protestant enclave of Scotch-Irish descendants. In reality, though, the town of Cullman was founded by Germans and its German Catholic roots are deep. Indeed, the Cullman skyline is dominated by Sacred Heart Catholic Church; St. Bernard Abbey of Benedictine monks and the Saint Bernard School are prominent in the town. 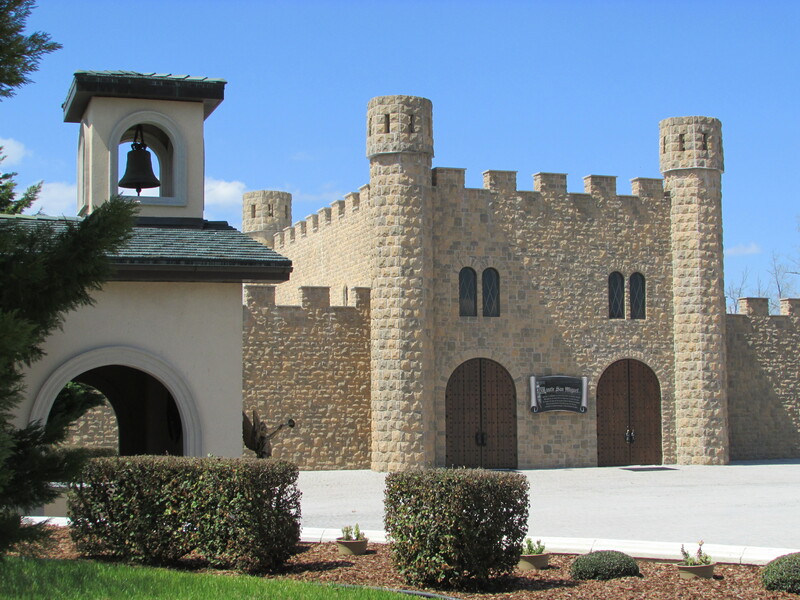 Ave Maria Grotto and its companion “Little Jerusalem” replicas of world religious destinations on the Abbey grounds have long been Cullman’s best-known tourist attraction. 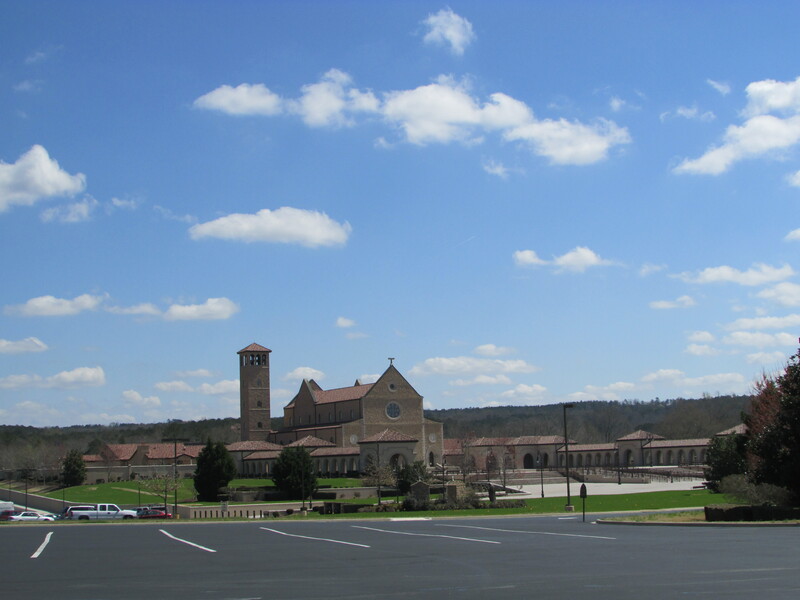 A little farther south of “Cullman town,” past Hanceville, the Shrine is the vision of Mother Angelica, the doctrinaire nun who started Eternal Word Television Network (EWTN), now the largest religious media network in the world, out of a garage in 1981. EWTN is headquartered in Irondale, a Birmingham suburb. I am not now nor have I ever been a Roman Catholic but curiosity and fascination with the scope of the network would drive me to occasionally look in on “Mother Angelica Live,” Mother Angelica’s daily show in the early years of EWTN. Mother Angelica has a certain charm, sharp wit, and charisma and is to be admired for her drive and commitment but sometimes her dogmatic proclamations and venomous rebukes made her sound a bit like a Christopher Durang creation. Still, it is an amazing thing that she started and the network continues to have massive global influence today. As the network grew and began 24-hour non-stop Catholic programming, Mother Angelica began to search for a place to relocate the monastery away from the bustle of the network. 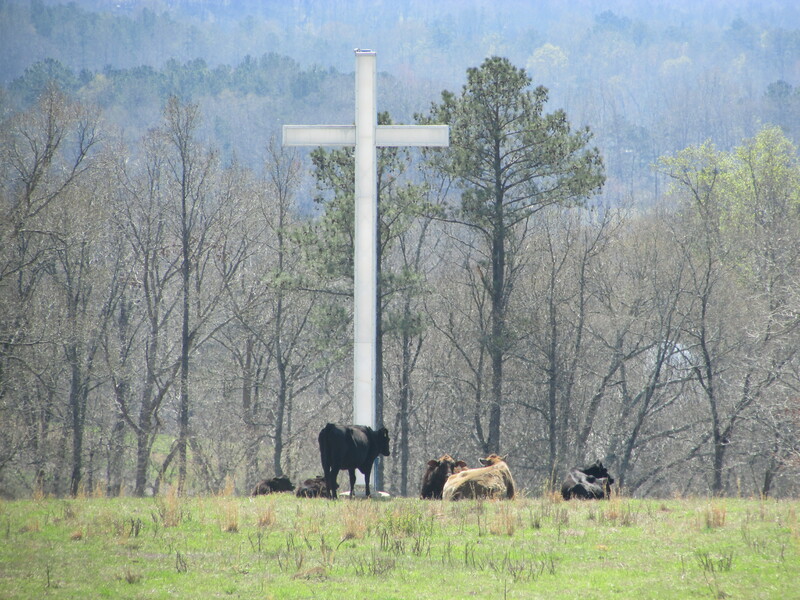 In 1995, she was able to acquire acreage to build a monastery and small working farm in Cullman County north of Birmingham. Soon, though, her modest plan exploded into a massive vision as she felt divinely called (by a voice emanating from a statue of the Divine Child in Bogota, Colombia) to build a Shrine. The result is a mind-boggling and somewhat surreal achievement in the rolling hills and valleys of north central Alabama. One exits the interstate and passes through Hanceville and drives past farms and country stores. Eventually, at the turn to the Shrine, there is a long curving drive lined with white fences. There are small guest houses for those making an extended visit to the Shrine. At the main gate, a sign advises visitors that the grounds are under video surveillance and that armed guards are on the premises (‘kumbaya,” right?). 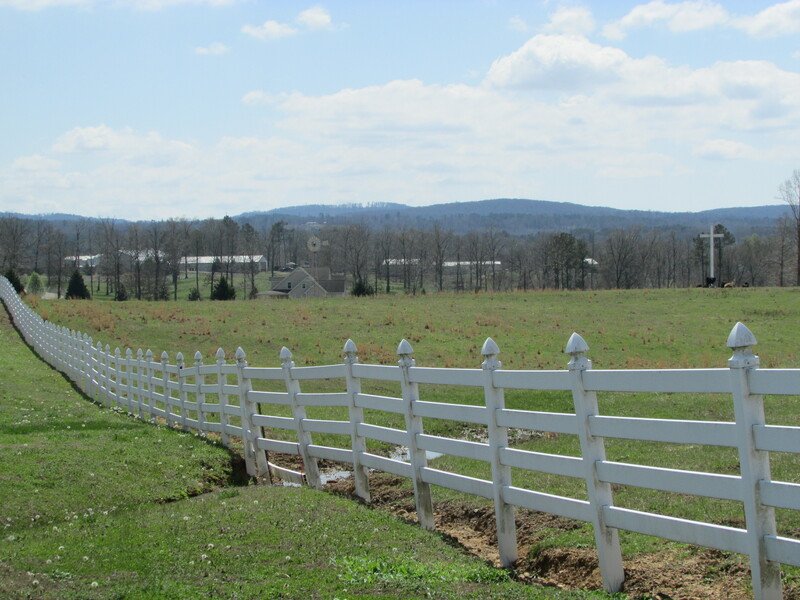 The farmland and pastures come into view and finally the buildings. There are substantial barns and farm buildings, and occasional religious sculptures, and then the main church, chapels, and related buildings are visible in the distance. Currently there are a substantial working farm; the cloistered monastery for the Poor Clares of Perpetual Adoration; the main church, The Temple of the Divine Child; a Shroud of Turin Display and Lower Church; massive colonnades and Stations of the Cross on either side of the main piazza; a life-size Nativity inside a small chapel; a small castle, Castle San Miguel, containing meeting rooms and the Gift Shop of El Nino; the John Paul II Eucharistic Center; and a replica of the Lourdes Grotto in France along the Mulberry Fork of the Black Warrior River. It’s a Roman Catholic Disneyland. And it is truly a magnificent and peaceful place. Standing in the middle of the huge piazza and looking at the large Romanesque-Gothic main church, the bell tower, and the surrounding colonnades inspired by 13th Century Franciscan architecture, one can’t help but be reminded of the great pilgrimage destinations of the world. The marble, limestone, and granite construction, the bronze doors, the gilding throughout, the magnificent statuary inside the various buildings and throughout the grounds, and the German-crafted stained glass windows add to the site’s sense of commitment and purpose, regardless of one’s spiritual stance. There are regular reminders to “remain silent out of respect for those in prayer” and throughout the place there are opportunities for quiet reflection and meditation. On the occasions when I have visited, there have been vehicles from all over the country in the parking lot and tourists and pilgrims from all over the world but it never seems rushed, noisy, or crowded. 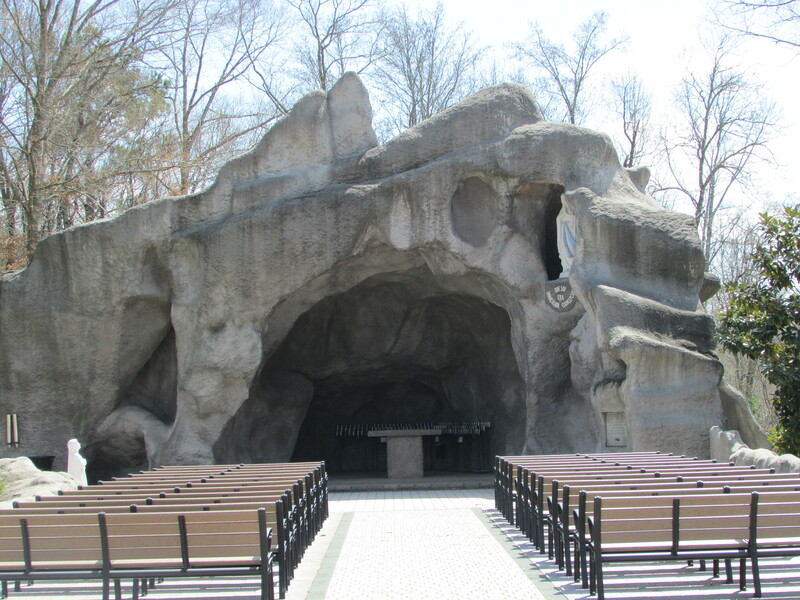 Walking down the path to the river and the replica of the Lourdes Grotto is probably my favorite part of the visit. The imposing rocky structure looms with the marble statues of Our Lady of Lourdes on high and Bernadette kneeling below. 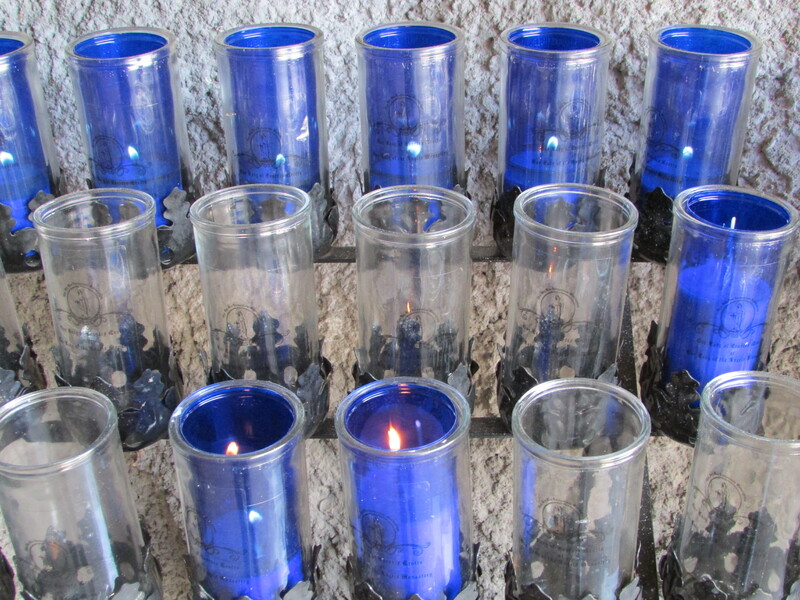 Votive candles burn on several levels against the curving back of the structure. 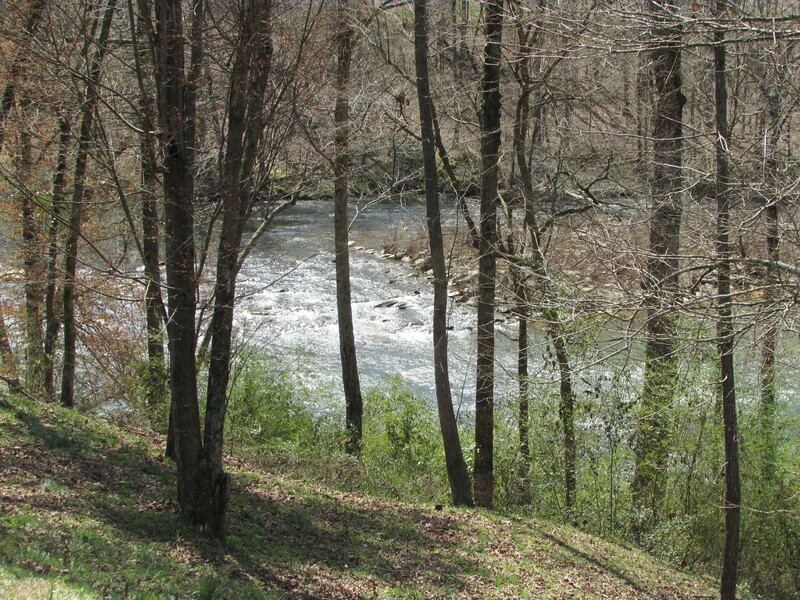 The only sounds I heard were the waters of the Mulberry Fork rushing over rocks in the riverbed, birds singing in early spring, and bees busily buzzing among the spring blossoms. Mother Angelica, who had the vision and doggedly plowed it through to fruition, is almost 92 now and lives in the monastery she envisioned. Reruns of “Mother Angelica Live” still air on EWTN but Mother Angelica is silent. She suffered a severe stroke in 2001 and her speaking ability was greatly impaired. According to her fellow cloistered nuns, she moves her lips in prayer, takes meals in her room, and often watches EWTN when she’s awake. This entry was posted in Cullman, Eternal Word Television Network, Hanceville, Mother Angelica, Shrine of the Most Blessed Sacrament and tagged Alabama, churches, Cullman County, culture, EWTN, Hanceville, Mother Angelica, Our Lady of the Angels Monastery, religion, Roman Catholic Pilgrimage Sites, Shrine of the Most Blessed Sacrament, the south, travel on March 26, 2015 by gedwardjourney. This is on pilgrimage list. Can’t wait to visit. It’s an incredible place, many miracles have taken place here. The peacefulness and beauty is overwhelming, truly a treasure for anyone of any faith to visit.